Find the latest Canterbury Farms Subdivision homes for sale in Grovetown, GA! Read more about Canterbury Farms Subdivision below. I'm available 7 days a week to set up a showing for any home for sale, no matter who the listing company is. Contact me today! Canterbury Farms Subdivision has, in my opinion, one of the best builders in Augusta - Ivey Residential Builders. Not all homes for sale were built by them, but many were in Canterbury Farms. As a result, I have countless happy families who live in Canterbury Farms who are nothing but thrilled with their builder. 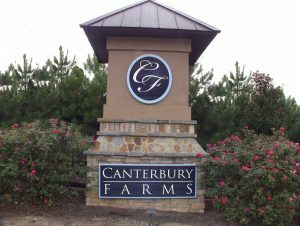 Canterbury Farms is just minutes to Fort Gordon, and many shops and restaurants are now opening up just up the road from Canterbury Farms (Starbucks, Kroger, Walmart super store, Applebee's just to name a few). I can offer a wealth of valuable information for you if I'm assisting in your home buying experience. Choose me, Mark Mulich, as your agent today by calling or clicking the chat button to the bottom right of screen. The community HOA website contains additional information about the subdivision. Pricing, floor plan, features and availability in Canterbury Farms are subject to change without notice. Heated Square Foot is approximate. All information deemed accurate but not guaranteed, buyer is responsible for verifying all information. For example, some photos or floor plans shown are of previously built homes and exteriors. Newbridge: Newbridge lots are about 65’ wide with homes in the mid $200,000 price range for homes up to about 2900 square foot. This phase only has a few more lots as of December 2014. Durham: Durham homes as of December 2014 include a covered back porch, radiant barrier sheating, 5” hand scraped hardwood in foyer and dining room, signature trim package, granite countertops with designer backsplash, gourmet kitchen package, architectural shingles, tile in owner’s bath, granite counter in owners’ bath, shower door in owner’s bath to match the lighting package. Durham lots give you the most elbow room, as they are about 85’ wide and are flat. If you hurry you may even get one of the few waterfront pond lots and basement lots. Durham hass homes range between $200,000-$400,000. Some of the Canterbury Farms homes for sale were built by Winchester Home Builders. They also build in The Retreat at Baker Place, Riverwood Plantation subdivision, Mccoys creek subdivision and Blackstone subdivision. Winchester is represented by Meybohm Company. The communities have different builder representatives who work for the builder. Please call Mark Mulich, your new construction expert as your buyers agent. I will get you any information you want so you can decide which builder, house plan and new home community suits you and your family the best. I will give you objective information about the pros and cons and work as your new construction buyer’s agent at no cost to you!